At the end of the day a race director knows more about how their event rolls out than anybody else, that is the way it should be. So much happened at the Lesotho Ultra Trail 2013 that no one person there will know everything, not even the Race Director Andrew Booth who has penned his thoughts here. 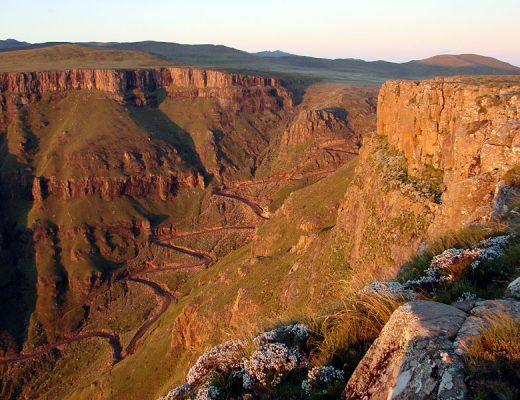 A count down from 10 and 92 runners set-off on a 50km course layed out in Northern Lesotho’s Tsehlanyane National Park. 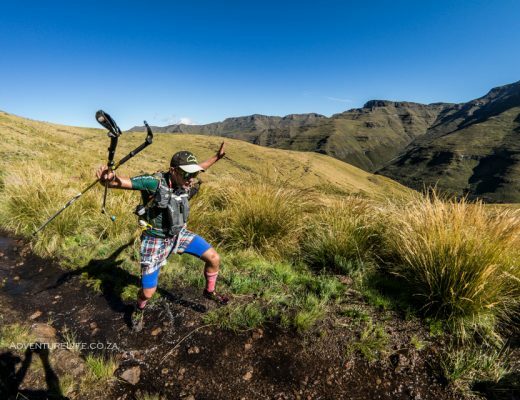 With 2500m of climbing and sanctioning by the International Skyrunning Federation and South African Skyrunning Association, it was Africa’s first Ultra Skymarathon. Months of work was being put to the test, the next 12 hours would determine success, failure or mediocrity. The race started with an 8km lap that almost returned to the starting point. This provided a great spectator opportunity and also allowed me to get a feel for who the top contenders would be. A group of 6 runners defined themselves from the rest at this stage, some big names and others lesser known, the racing at the sharp end was mouth-watering. 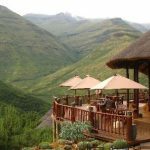 The nervous faces from the start line had relaxed and the field was enjoying the flowing single track of the upper and lower trails around Maliba Mountain Lodge. The climbing became serious shortly after the 10km mark and the field spread quickly. Lucky Mia, Iain Don-Wauchope and AJ Calitz pushed ahead slightly through the switchbacks leading to the second checkpoint and aid station at the 14km mark, 2750m above sea level. All 3 elite runners were surprised when unknown Quinton Honey caught the group on the contour path linking the two climbs that took the runners to the top of the Maluti Mountains, 3150m above sea level. But on the second climb Mia decided to make a break by surging ahead and then quickly disappeared into a layer of mist that covered the highest ground along the ridge. The mist played a massive role as following the markers became a whole lot more difficult in these conditions. The climbs and descents on the course are on purpose cut trail, but the 11km traverse along the top of the escarpment is on a myriad of sheep and cattle tracks that come and go. The line of regular markers low on the ground became less obvious to the eye. Miya soon lost the line of markers and valuable time. Calitz and Don-Wauchope were having their own problems not far behind, picking up the trail and then loosing it again, but pushing on following the ridge line in hope they would find the markers and rejoin the marked trail. This worked several times before they followed a jeep track down the wrong ridge. When Calitz arrived at the main aid station he showed me his GPS reading at 38.8km, those further back in the field had readings closer to 35; AJ and Iain had run an extra 4kms and lost at least 25 minutes if not more, a big price to pay in a race like this. Meanwhile Quinton Honey, Andrew Hagen and Manuela Diez-Raobago and teamed up and grid searched the ridge calling to one another each time a marker was spotted, a tactic that helped them reach the main descent first. At this point, lightning quick descender Andrew Hagen must have begun licking his lips. In hind sight, Iain and AJ should have used less risky tactics, but with the pressure of Miya getting away in front of them and the need to create a gap ahead of Hagen before the descent, they could ill afford to slow their pace or turn back too often. The second group to starting descending included the leading ladies, Tracy Zunckel and Robyn Kime. By the end of the descent they had been joined by Calitz and Don-Wauchope, who had decided not to try and chase a podium finish but rather enjoy the spectacular scenery of the Maltui Mountains. It had been a long and intense year of running for both of them and on the day, their fulfillment came from camaraderie and not competition. Andrew Hagen punched his advantage home – by the end of the main 7km descent that drops from 3150m down to 1900m, he had a 4 minute lead. He extended this to 15 minutes by the finish to claim the crown as the first Lesotho Ultra Trail champion. Raobago had pushed ahead of Honey down the main descent and up the second climb, but although Honey was reeling him in over the final kilometres, the race was just too short and Roabago finished 2nd, a minute ahead of Honey in 3rd. In the ladies race, Kime and Zunckel kept pace with one another over the first 40km, when Zunckel pulled ahead to take the line 11 minutes ahead of 23 year old Kime. The spirit of their race was incredible, they worked together through the mist on the ridge, chatted and bonded virtually all the way, setting the tone for those coming behind them. 15 minutes behind Kime was Canadian Ultra runner Stacie Carigan. She had travelled far to compete in this race and her third spot in unfamiliar mountainous terrain was very impressive. In a race like Lesotho Ultra Trail the front runners are always going to draw a lot of attention, but kudos must be given to the back runners, those that are out there for twice as long as the winners, struggling up and down the mountains. The final major climb of the day was 3km long and took some backmarkers more than 2 hours. Yes, Kudos to all of you! Nine runners withdrew before the final climb, the final three runners were pulled from the course as heavy afternoon clouds built up and claps of thunder told the safety crew that time in the mountains was up. Lots of lessons were learned at LUT2013, some by the organising team and others by the runners. What we know for sure is that everyone who was part of the inaugural event came away with a rich experience that will change them in some way. LUT2013 was a great success, a massive team came together from different parts of South Africa, Lesotho and overseas to pull it off. There are simply too many people to thank. It was the most dynamic and passionate team I have ever worked with and the event reflected that in every aspect. I cannot wait to get my teeth stuck into LUT2014!